Stephanie Gray and Lawrence 'Mac' Moore have been selected as recipients of the 2018 Mr. and Miss SFA Award. 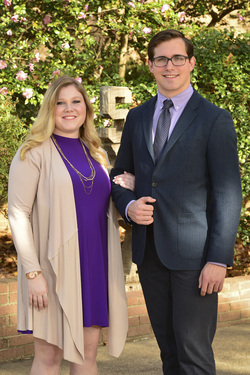 NACOGDOCHES, Texas - The Stephen F. Austin State University Alumni Association announced Lawrence 'Mac' Moore of Heath and Stephanie Gray of Waxahachie have been selected as recipients of the 2018 Mr. and Miss SFA Award. The Mr. SFA Award was established in honor of the late Stan McKewen, a 1934 SFA graduate. The Arnodean Covin Miss SFA Award honors the late alumna who was named Miss SFA in 1940, 1941 and 1942. A 2013 graduate of Rockwall-Heath High School, Moore, who received the Stan McKewen Mr. SFA Award, is a senior finance major and the son of Larry and Rachel Moore. "Lawrence has truly shown that he cares for others more than himself through his participation in organizations and community events," said Saville Harris, coordinator of student engagement at SFA. "He makes you want to be a better you with his positive outlook and willingness to help others." Moore serves as a member of the Mast Student Investment Roundtable, president of the SFA Inline Hockey Club and president of the fraternity Tau Kappa Epsilon. Additionally, Moore has volunteered with The Big Event and assists with his fraternity's community activities, including St. Jude Children's Research Hospital fundraisers and visiting patients in Nacogdoches nursing homes. "I've learned the great value of friendship and brotherhood, what it means to have pride in your school and how to find value in even the smallest things," Moore said. Gray, recipient of the Arnodean Covin Miss SFA Award, is a 2013 graduate of Avalon High School. She is a senior hospitality major and the daughter of Steven Davis and Stacy Wilson. "I strive for excellence in every aspect of my life at SFA and apply the SFA Way to all involvement in my life," Gray said. Gray is active in many community and SFA activities, including volunteering with the Boys and Girls Club, the Nacogdoches Convention and Visitors Bureau, SFA Big Jacks, Omicron Delta Kappa leadership honor society and the Volleyball Club. "I am impressed with Stephanie because of her active involvement in our fundraising project as the chair of the logistics committee," said Dr. Gina Fe Causin, assistant professor of hospitality administration. "Her involvement demonstrated her dynamic personality, leadership, communication and organizational skills. All these characteristics will help her become a role model for the hospitality management students and within the industry." SFA's Alumni Association awards the Mr. and Miss SFA titles annually to exemplary students who will represent and promote the university. Recipients are selected based on their scholarship, participation and leadership in academic and co-curricular activities, and citizenship, service and loyalty to the university. A committee of faculty and staff members, community leaders and alumni makes the selections. The recipients will be honored Saturday, Feb. 24, 2018, at Johnson Coliseum during halftime of the Lumberjack basketball game, which begins at 6 p.m.